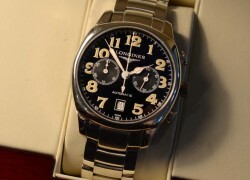 Item description: The Longines Spirit limited edition range was brought to market in 2010, and the more interesting versions, such as the chronograph, were quickly sold out. 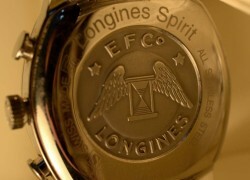 According to Longines, the concept around the ‘Spirit’ range was about paying tribute to the watchmaking spirit that has been resident with Longines since its inception in 1832. 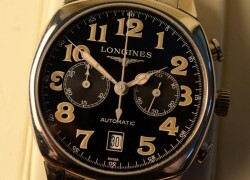 The styling is based on early aviator watches from the 1930s. This example was the most desirable of the ‘Spirit’ range, the double chronograph with black enamel dial. The watch case is in polished stainless steel of large proportions, and has an equally large black enamel dial. The latin hour numbers, along with hands are finished in beige Tritium luminous material, and give a particularly pleasant ‘vintage’ feel to the watch. The dial has two sub counters, along with a calender at the 6.0 position. One nice touch to this watch, are the flat headed chrongraph pushers, firstly, they, once again, give a ‘vintage’ feel, but they are remarkably easy to use as well. 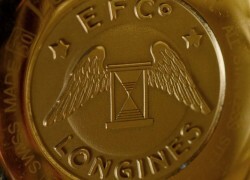 The case-back has the Longines brand and logo in relief , along with the reference numbers etc. 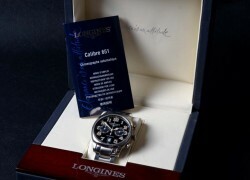 The movement is the Longines classic calibre 651 automatic movement. 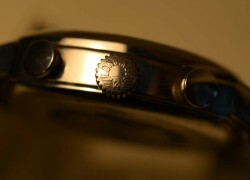 The watch is complete with its stainless steel branded watch bracelet. 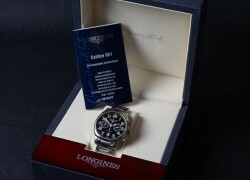 Additional description: In addition to the watch, is the original large blue and cream Longines ‘Spirit’ case, extra links for the bracelet, and the original Longines chronograph Instructions For Use. Condition report: Mint condition, storage age only. The instructions in mint condition. The case showing signs of storage use only. Special notes: This is a very adaptable watch. It looks at its classic best with a good aviator style leather strap, or in a more modern context with the bracelet. The watch is ideal for motor racing /rallying use.